It’s the aesthetic that grabbed me. 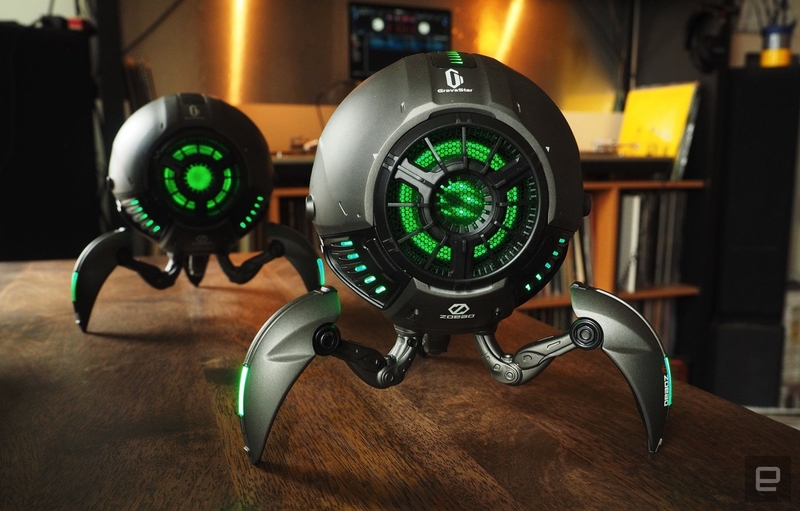 Bluetooth speakers have become commonplace, but a desktop spheroid robo-speaker with glowing lights? That’s intriguing. 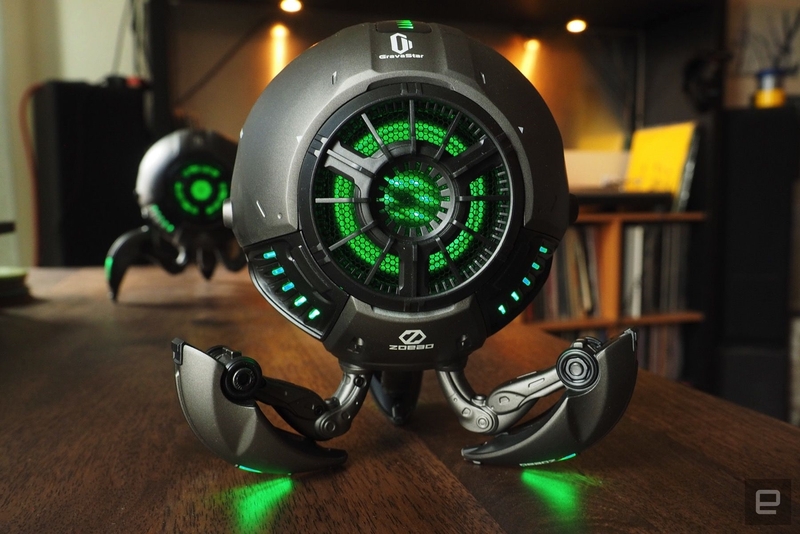 Being from a crowd-funded startup does lend itself to a bit of skepticism, but after getting to test the GravaStar by Zoeao, I found that it’s no cheap plastic toy. It has a solidly built metal exterior, bright green accent lights, a Qualcomm chipset and Harman Kardon audio components. If the design appeals to you as well, you can pick one up for $129+ on Indiegogo as an early bird backer. And if you get in quick enough, you may even have one in your home before May. As for the Zoeao’s GravaStar itself, there’s not a lot to unpack: It works as a single Bluetooth or 3.5mm aux-in wired speaker, or it can pair with a second one for True Wireless Stereo (TWS). There’s no mic for calls, though, and it’s not a smart speaker. Inputs are on the underside of the device, including the aux-in and a fast charging USB-C port. Both cables are included and have a nice fabric mesh exterior, but they do come up a bit short at just around 3 feet long each. The company claims its battery lasts up to 30 hours, although I haven’t had a chance to put that to the test yet. When the charge gets low, you should see a flashing light (on the rear, opposite the Bluetooth connection indicator) as well as a vocal prompt. On the outside, it’s a desktop decoration with futuristic cool, a zinc alloy shell and decent heft at 3.5 pounds. The speaker grill area and multiple zones on the top, back and legs radiate a green light (which can be turned off and on via a rear button). It’s bright enough to work as nightlight or provide ambiance when the lights are low. It’s just bright enough that you can see the nearby workspace and find your drink, keys or whatever. It’s definitely not bright enough to handwrite your next novel by, though. The robot’s legs fold in halfway when needed to help keep them safe if you’re moving the speaker around the house or taking it on the go. And if you are leaving the house, it has an IPX5 rating so a little rain should be fine. The design also allows you to tilt the speaker by folding a leg or two, if that suits your needs. And each foot has a small bit of padding to help protect surfaces. All that said, the GravaStar speaker is quite good and provides a respectably loud, clear and thumpy output for its size and shape. Plus you’re getting more than just a speaker. Its futuristic design and lighting accents make it feel a bit more like a shelf-top collectible and discussion piece. For those who dig its style, I’d recommend it easily based on my short time with it, especially if you snag one for the early bird pricing of $129. Those looking for high-resolution audio with the most bang-for-buck ratio and don’t care about design may want to shop around a bit. Zoeao’s Indiegogo page is live today and you can pick up one or more GravaStar speakers from a variety of early-bird deals. Once the speaker heads to retail, it should be priced around $250. That expedited delivery date is due to the company getting things ready in advance. Well, in a way. If the GravaStar looks familiar, you may have seen it on Kickstarter late last year. The team behind it made quick progress toward funding the project but soon realized there were some production issues with their current plan. The project was pulled in order to fine tune the component selection and production process. It was better than getting caught rushing a lesser product out to its backers. Having tried both versions, I can tell you this was the right choice and they were able to fix the issues. The look and feel hasn’t changed though. All that effort means this is one of those crowdfunding deals where you should be getting the final product shortly after a successful funding round. At least the first 1,000 or so units, anyway.